Kaziranga National Park is a national park in the Golaghat and Nagaon districts of the state of Assam, India. The sanctuary, which hosts two-thirds of the world's great one-horned rhinoceroses, is a World Heritage Site. 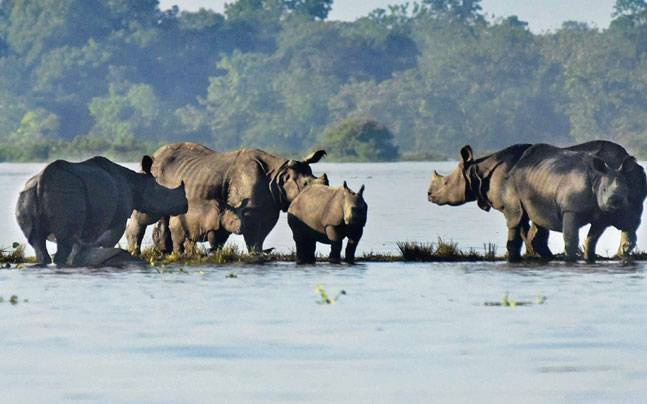 According to the census held in March 2018 which was jointly conducted by the Forest Department of the Government of Assam and some recognized wildlife NGOs, the rhino population in Kaziranga National Park is 2,413. It comprises 1,641 adult rhinos (642 males, 793 females, 206 unsexed); 387 sub-adults (116 males, 149 females, 122 unsexed); and 385 calves. In 2015, the rhino population stood at 2401. Kaziranga is home to the highest density of tigers among protected areas in the world,and was declared a Tiger Reserve in 2006 (now the highest tiger density is in Orang National Park, Assam) . The park is home to large breeding populations of elephants, wild water buffalo, and swamp deer. 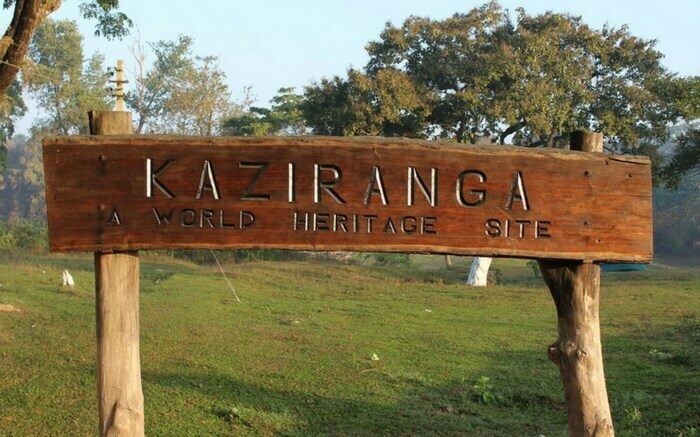 Kaziranga is recognized as an Important Bird Area by BirdLife International for conservation of avifaunal species.When compared with other protected areas in India, Kaziranga has achieved notable success in wildlife conservation. Located on the edge of the Eastern Himalaya biodiversity hotspot, the park combines high species diversity and visibility. Kaziranga is located between latitudes 26°30' N and 26°45' N, and longitudes 93°08' E to 93°36' E within two districts in the Indian state of Assam—the Kaliabor subdivision of Nagaon district and the Bokakhat subdivision of Golaghat district. The park is approximately 40 km (25 mi) in length from east to west, and 13 km (8 mi) in breadth from north to south. Kaziranga covers an area of 378 km2 (146 sq mi), with approximately 51.14 km2 (20 sq mi) lost to erosion in recent years. A total addition of 429 km2 (166 sq mi) along the present boundary of the park has been made and designated with separate national park status to provide extended habitat for increasing the population of wildlife or, as a corridor for safe movement of animals to Karbi Anglong Hills. Elevation ranges from 40 m (131 ft) to 80 m (262 ft).The park area is circumscribed by the Brahmaputra River, which forms the northern and eastern boundaries, and the Mora Diphlu, which forms the southern boundary. Other notable rivers within the park are the Diphlu and Mora Dhansiri.